He bites like a tiger, hisses like a snake, and even managed to survive getting attacked by a dog. That’s pretty tough for a little duck that weighs about as much as a can of Coke. 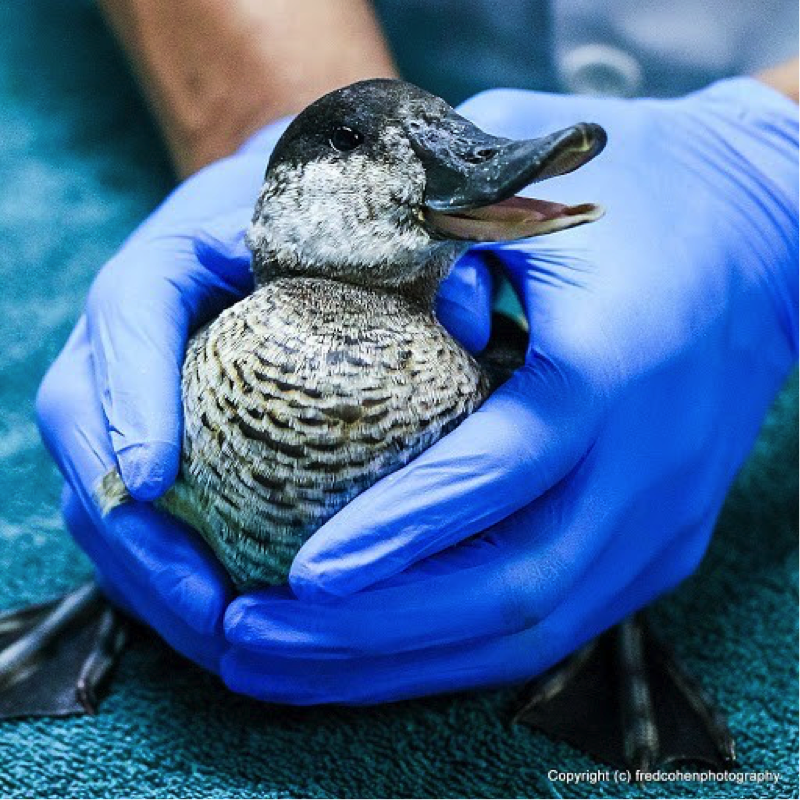 This Ruddy Duck was found in Brooklyn, entangled in a rubber band and unable to walk or stand. The band had cut into his head and beak, and he had puncture-like wounds on his back and flank from where he had escaped from a dog. After arriving at the Wild Bird Fund Rehabilitation Center in Manhattan, we cleaned his wounds, started him on antibiotics, and the next day stitched him up in surgery. We put him on cage rest to recover and decided that he had been incredibly lucky. But we shouldn’t have been so surprised: Ruddy Ducks (Oxyura jamaicensis) are bold, aggressive birds that don’t seem to know how small they really are. In the wild they readily attack each other, and have even been known to chase away rabbits onshore. 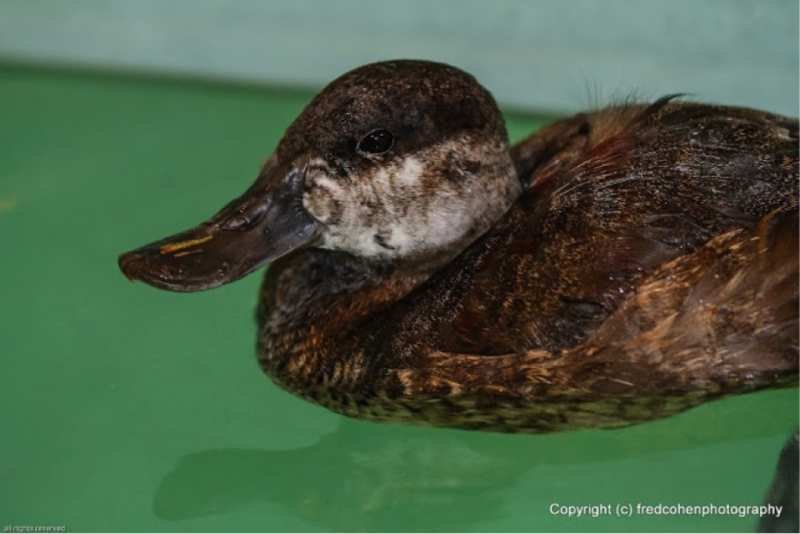 At the center, unlike the majority of our patients who eagerly search out the part of their cages furthest from us, our Ruddy Duck spent his days hissing viciously at feeding time and biting any hand that got too close. Even if he did manage to bite down, however, it wouldn’t really hurt. Ruddy ducks hunt aquatic insects and invertebrates by straining mud through their bills, so they don’t have any teeth. And despite their ferocious behavior, they are often preyed upon by larger birds, such as hawks and owls. This has made them quite adept escape artists – a skill our patient showcased quite well when we would try to fish him out of the rehabilitation pool after his daily swim – and may have been how he escaped from the dog in the first place. Having grown accustomed to this fiesty temperament during rehabilitation, we expected quite a dramatic scene when he was finally approved for release. A group of us brought him down to the lake in Central Park and gently removed the lid from the top of the cage, looking to see if he would escape before we had lifted it away. But he surprised us by sitting quite still, looking around with the most demure, innocent expression. He took a few steps, sat back down, and then with a little more encouragement stepped placidly into the water and slowly swam away. I would like to think that his experience at the Wild Bird Fund had shown him that we mean him no harm, but I know better – he’s back in the wild again, and those other ducks in Central Park better watch out.